Developing and launching a new product requires a fine-tuned orchestration of design excellence and user understanding. From the "Design Ladder," we know that evolving from just tinkering with design to integrating design at a corporate strategic level can increase performance by 10-40 percent. The fundamental challenge for most firms remains for them to build their design capabilities by systematically developing their designers' skills. It takes a team of design experts, design managers and design leaders to lay the foundation for long-term sustainable design performance. The front end of new product development process is a good vehicle for building design capabilities with a strong competitive advantage. Demonstrating measurable improved outcomes over a series of projects can increase management's understanding of and confidence in design. In turn, this helps management see how investment in design represents a strategic competitive advantage. Perfecting the translation of business requirements into actionable design quality criteria is a good starting point for such an undertaking. Studies show that translating marketing data into concepts is the most challenging of all the marketing, user and engineering information designers need to consider. 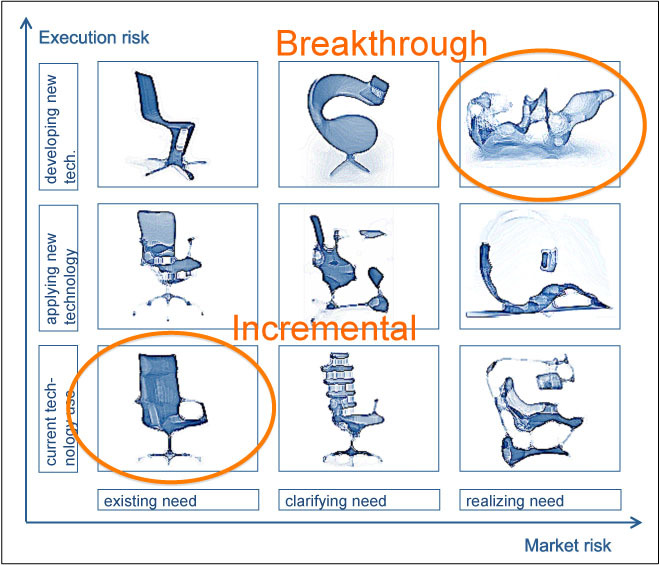 Therefore, our focus is on proposing a new visualization method for establishing a path to growing new capabilities in formulating design criteria. First, by applying a "Market risk - Execution risk" map to establish a firm's strategy, from incremental to breakthrough innovations. Once this is determined, we then move on to using an "Orientation - Execution" map and arranging four established design methods according to their orientation (design driven vs. market driven) and execution type (data driven vs. goal driven). These four categories of design methods represent fundamentally different approaches to establishing design criteria. Starting from the approach the design group currently applies; these categories can systematically explore and gain experience in the use of the alternative approaches on the conceptual project. While mastering the new approach, the corporation's team can then combine their new skills to provide more comprehensive design solutions. In the "Market risk - Execution risk" map, the corporation's development strategy shows its indented position along two axis; market risk (targeting existing needs, clarifying needs or discovering new needs) and execution risk (existing technology, applying technology from outside the firm or developing its own new technology). When management has committed to a strategy allocation of resources along the two axes, the next step is to define the appropriate design expression. (1) Product Life Cycle, which orientates the proposed offerings according to the lifecycle of a new product or service: alpha / beta testing, market introduction, growth, maturity and saturation. This suggests the best design approach: curate, endorse, integrate, economize and refresh and how to design style for MAYA (Most Advanced, Yet Acceptable). (2) Design Language establishes the level of embellishment (from minimal to surplus) and communication of concept (from indirectly to directly), as defined by the firm's design philosophy, which then informs the design elements expression. (3) Corporate Design Strategy establishes the hierarchy of brand attributes, design language, design principles and signature elements, reflecting corporation's personality. (4) Brand Identity maps design onto marketing to identify appropriate personalities, to which the user inhabits or aspires. Design then expresses these in the design by using proportions, surface and details. How does navigating the matrix benefit marketers and designers? First, it helps them to agree on what to archive. For example, when management brings up Corporate Design Strategy, everyone understands that the focus is not on the current situation but on the goal. Secondly, the matrix helps the design group to use the different approaches most efficiently. In the initial stages of a project, marketers and designers can be obsessed with collecting data without considering the goal to reach. 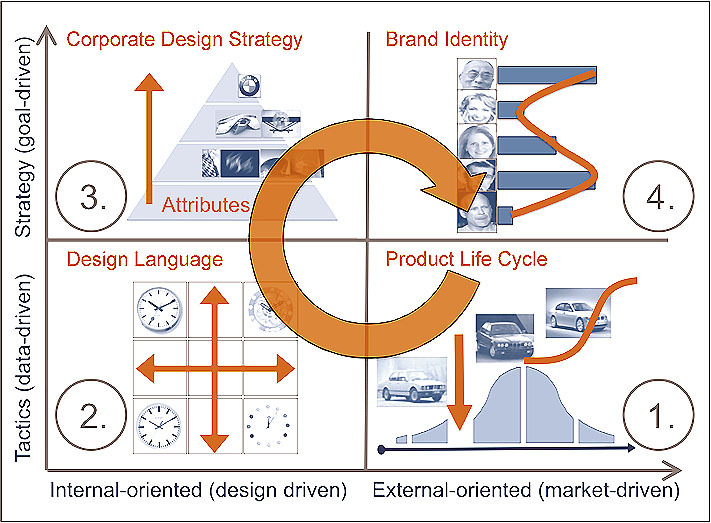 They use the goal-driven approaches of Corporate Design Strategy and Brand Identity to see the bigger picture of their project, and then move on to the data-driven approaches of Design Language and Product Life Cycle to make informed decisions. By building capabilities in one segment at the time, design can systematically build a comprehensive set of capabilities and can move the corporations design forward with quick intention.